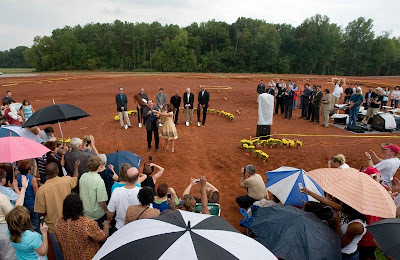 Today, Calvary Assembly held an official ground breaking ceremony. Many of my photography friends and colleagues grimmace at the prospect of making pictures at a, GBC we will call it. I will admit I have yet to see any clip winners from a GBC, but that didn't stop me from trying to do something a little different. A good friend of mine made a picture at a GBC one time that ended up in a picture story he did that featured one of the ground breakers. So even though they may seem unimportant you never know when something meaningful will come out of something mundane. To spice this assignment up a put one of my cameras on a 20 foot light stand and had an assistant (thank you again) hold the lightstand and trigger the camera for me. I premised him by saying just push the button when something interesting happens. I think he nailed it.